COOK COUNTY CRIMINAL COURTHOUSE — On Monday afternoon, Martinez Sutton stood in a Chicago courtroom, shaking with rage as he hurled expletives at the Chicago Police detective who shot and killed his sister, Rekia Boyd — and was acquitted of all charges. 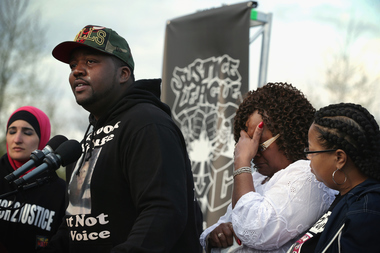 Within 24 hours, Sutton found himself in front of the U.S. Capitol building, where he addressed hundreds of activists who'd marched to Washington, D.C., as part of a weeklong #March2Justice campaign. "'This is not a courtroom for emotion,'" Sutton said as he recalled Judge Dennis Porter's opening words. "'This is a court of law, so if you're feeling emotional, you might as well hit the door.' That was [when] I figured we lost this case." Sutton's 22-year-old sister was shot in the back of her head in March 2012 when off-duty detective Dante Servin opened fire at a crowd near Douglas Park. Servin claimed he saw a man in the group pull a gun, but police never recovered a weapon, and prosecutors said the man was holding a cellphone. On Monday, Porter dismissed the case against Servin, who'd been charged with involuntary manslaughter. Porter argued that the legal definition of manslaughter requires someone to act recklessly — and since Servin was purposefully pointing and aiming his gun, he wasn't acting recklessly. "To me, it's just a ploy," Sutton said in a phone interview Tuesday. "If he had murder charges, the judge would've said the same thing: 'Oh, it should've been involuntary'manslaughter.'" Cook County State's Attorney Anita Alvarez issued a statement saying she was "extremely disappointed" by Porter's ruling. "The State’s Attorney’s Office brought charges in this case in good faith, and only after a very careful legal analysis of the evidence, as well as the specific circumstances of this crime," she said. "I believe that my office had provided sufficient evidence before the court to not only demonstrate, but also to prove, that Officer Servin’s conduct was clearly reckless in the senseless fatal shooting of Rekia Boyd." Sutton said his family plans to pursue the case federally or in civil court, but they're still weighing their options. "I'm still trying to figure it out, really. This is my first time in this position," Sutton said Tuesday, pausing when a crowd cheered in the background and actor Danny Glover took the stage behind him. "I'm just stunned by the decision. Really, I'm stunned." Sutton continued: "Everything is going to be good, though. You know I have faith. [The case] is not going to be put away this easy. ... They're trying to waste time because they know families are going to give up. But I'm not going to give up. I'm not going to let these murderers walk around." But several legal experts said pursuing the case further in the court system seems unlikely. To start, Servin can't be tried for the same homicide twice. "There's a double-jeopardy bar," said Jerry Norton, a professor at Loyola University Chicago School of Law. "He has gone to trial for a homicide, and [the case] was discharged, in effect finding him not guilty. He cannot be tried in the same homicide again, whether it's charges of murder or manslaughter." Federal prosecutors could choose to frame the case as a violation of Boyd's civil rights, according to several attorneys consulted. But each countered that since Servin was off-duty when he opened fire, and since there didn't seem to be an obvious racial motivation, that would be extremely difficult. A spokeswoman with the U.S. Attorney's Office in Chicago declined to comment. Alvarez called Porter's decision "unexpected." But Sutton said he knew what was coming as soon as he walked into the courtroom Monday. "It was just a whole feeling in that courtroom," he said. "They had German shepherds. They had extra police. That just let you know that you lost when you walked in." Still, Sutton said, his family will continue to seek justice for Boyd. During Tuesday's rally, the siblings' mother stood behind Sutton, but was too emotional to speak.